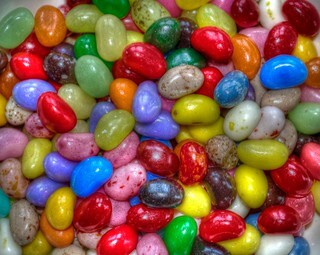 It's Easter, and here in the United States, that means more jellybeans will be consumed today than on any other day of the year. The jellybean is one of my all-time favorite candies. While I appreciate the exotic flavors popularized by Jelly Belly, I tend to favor the classic, larger beans, whose flavors are often described by color ("I like the red ones!") rather than taste. And, yes, I even enjoy the black ones, though I'm not one of those fanatics who buys entire bags of them. What's your favorite flavor and/or style of jellybean?